(Southern Weekend) These government officials believe in fengshui, gods and ghosts, but not Marxism-Leninism. May 17, 2007. By Guo Li (郭力). While the rotation of local government and party officials is progressing, the ancient profession of "fengshui 风水" has discovered new opportunities. In order to "save their jobs" or "get promotions," some officials have focused on their time/date of birth. Or they move their ancestral graves to a "precious site"; and many people even invited "grandmasters" to come and post a "magical talisman" to ward off the evil spirits of their competitors. According to an informed source, a deputy department head in Zhejiang province moved his ancestral grave all the way to the foot of the Tianshan mountain in Xinjiang province. "Within the past six months, I have taken on more than 30 projects." Fengshui master Yuan Jingzhai of Hangzhou told the Southern Weekend reporter. National School of Administration professor Cheng Ping has just completed the "Study of Scientific Knowledge of County-level Department Public Servants in China." 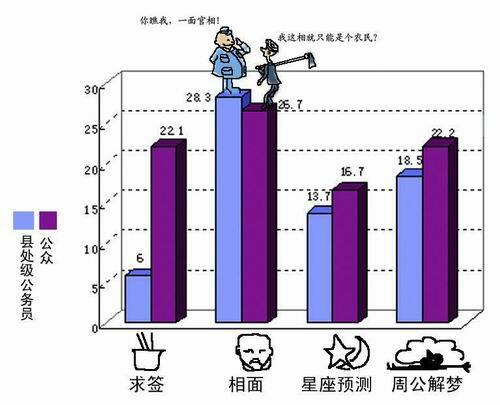 This research report stated: although the level of scientific knowledge of county-level department public servants is higher than that of the ordinary citizens, less than half of the officials do not believe in any of the following superstitions: reading faces, dreams, astrological signs and bamboo slips. Percentages of people who "believe a lot" and "believe somewhat"
"The proportion of county-level department officials who believe in face reading is even higher than among ordinary citizens," Cheng Ping told our reporter. In the issue of Qiushi magazine published on May 1st, 2007, the following criticism appeared: "At present, a small number of party members are wavering in their loyalty towards the Party and they are gradually weakening ... some Party members believe in gods and ghosts instead of Marx and Lenin. This deserves major attention." The taoist priest Jiuzhen from Chongqing claimed to have been commissioned by a local government bureau-level official to provide 24-hour-a-day prayers in order to ensure his promotion. This taoist priest told our reporter: this government official wears a piece of jade that has been "blessed." This "precious jade" was prepared this way: based upon the time/date of birth of this person, the taoist priest Jiuzhen wrote the "magical incantation" on his photograph and then placed it on the temple altar with the jade for 7 x 7 = 49 days. "Physical health and safety while working outside on projects," "steady government position" and other "designated information" have been "entered." At the end of the year, the jade will have to brought back to the temple altar in order to enter the new information for the fortunes of the next year. For the entire project, the government official has to pay 6,000 to 7,000 yuan. If he has any special emergency demands, "it will depend on the difficulty in realizing it, and the price varies from several thousand to more than one hundred thousand yuan." Countless examples are available to show that Chinese Communist cadres -- including some senior officials -- have been captured by mystical philosophy. The Hebei province State Tax Department former director Li Zhen was told by a fengshui master that "he would become a senior official within five years" and was so delighted that he paid 8,000 yuan. Shenyang city Middle Court former director Jia Yongxiang got the court's leaders to spend 30,000 yuan to hire a fengshui master to determine the "date of moving" into the new office building. Shandong province Tai'an county former party secretary Hu Jianxue was told by a fengshui master that he "would be a vice-premier except for the lack of a bridge" and he therefore re-routed the expressway to go over a reservoir on a bridge. "Among the cadres in the county-level departments, a sizeable number of them have fengshui consultants to do their planning." Yuan Yongzhai told our reporter. At the Yongzhai Hall that he established in Hangzhou, the main business activity is fengshui consultation. In the "Study of Scientific Knowledge of County-level Department Public Servants in China" conducted by Ching Ping, the market of fengshui theory is quite large among party members and cadres. 900 county-level department officials in seventeen provinces/municipalities such as Shanghai, Hunan, Qinghai and others participated in this study. According to the survey results, almost 30% of the officials said they "believe a lot" and "believe somewhat" in "face reading." According to the "Sixth Study of the Scientific Knowledge of Chinese Citizens" conducted by the Chinese Research Institute of Science Popularization, the percentage of "believe a lot" and "believe somewhat" among citizens was 21%. You should note that these county mayors and department heads have university degrees or higher and many of them have attended Party schools. Following the application to make fengshui into a non-materialistic cultural heritage, certain universities have started to offer courses in fengshui and the fenghsui masters do not hide their activities anymore. But most of the time, the fengshui masters and the government officials conduct business secretly. "Many fengshui masters do not grow beards, they don't wear traditional Chinese clothing, and they conceal their identities." Yuan Jingzhai said with a smile: "They usually wear ties and look like salespeople." Taoist priest Jiuzhen said: "If they go to inspect an office, it is usually on the weekend when nobody is around." Another rule that all officials follow is to never seek out a local fengshui master. "Local people are likely to leak the information and the risks are too huge." "I-ching grandmaster" Changxuan Lichen told our reporter that he met with a certain Jianxi deputy department head in a Hunan hotel. "Sometimes we have to go and inspect the home of the official. We don't even get to see the owner. Afterwards, we had to tear up all the calculation sheets and maps to assure that the information will not be leaked out," said a fengshui master who asked to remain anonymous. Ordinarily, the main clients of fengshui masters are business people instead of government officials. But from the second half of 2006, the local government began to have job rotations. The "grandmasters" then "shifted" the focus of their work to cater to the party and government officials. A fengshui master who requested to remain anonymous said that in December last year, he went to "inspect the offices" for several places in a coastal province. These officials all have the power to choose the location of their offices in their buildings. During the process, at the southeast corner of the desk of one official, the fengshui master placed a bronze bell. According to the industry jargon, this is a an impenetrable bell that will seize the fortunes from the southeastern direction. "Compared to business people, the officials are more likely to believe in 'mystical' stuff." Yuan Jingzhai summarized his experience. "If you just re-arrange their offices, they will think that it is too simple and they are worried. So you must bury some lucky charm on the ground, or set up a battle array, then they will feel that it is going to work miracles." Changxuan Lichen has similar observations. "Party and government cadres like to use talismans." These paper slips marked with symbols that only the fengshui master can decipher are usually placed in hidden corners in the offices, such as behind the desk drawers, or behind the hanging clock, or even sealed under the concrete floor ... "when the setup for an official is successful, he will get down on his knees and thank me with tears in his eyes," said Yuan Jingzhai. "When the fengshui master sets up the battle array and the talismans for the officials, it is a psychological aid most of the time." Changxuan Lizchen said. "It makes them feel that fengshui has been brought in and the matter should be successful. Thus, they gain confidence. The success of something depends largely on the confidence of the person." Yet, fengshui has some practical returns for the government officials. Since the cadres do not want to have direct ties to "grandmasters," it is usually some big boss close to the official who invites the fengshui master. A certain fengshui master who has inspected the homes of several government officials told this reporter: "The corresponding fees are usually paid by the business people." The report found out that the fee for hiring a professional fengshui master has a market price between 100,000 to 200,000 yuan. Some of them even charge more than 1 million yuan. The price for making one fengshui inspection or astrological reading varies between several thousand to tens of thousands of yuan. "Fengshui can promote social connections and friendships." One grandmaster said. "As a fengshui person, I know my role: I have to form a connection between the past and the future and it has nothing to do with politics." Their business friends are also aware of this. When the fengshui masters form the connection between the past and the future, they form a network between business people and government officials. There is a legend in the fengshui industry: a certain state enterprise was at the critical moment where it might be shut down. Through the mediation of a fengshui master, a certain important person was invited to attend a public relations event. As a result, the state enterprise obtained a one billion yuan loan. This fengshui master received a "consultant's fee" of 10 million yuan subsequently. "There are some messages that only a fengshui master can deliver." A certain Zhejiang business person who requested to remain anonymous told our reporter. In order to join this network, one must follow the corresponding rules. "Everybody needs this exchange platform of connections." A student of Yuan Jingzhai said. She is presently learning the relevant techniques for "face reading" and "astrological reading." "Behind the success of political economy, there is our force. These are the hidden rules underneath the surface," said Yuan Jingzhai. But in the eyes of certain people in the legal field, these hidden rules have broken the law. "If the official had instructed the business people to pay for the fengshui fees, it is undoubtedly a case of bribery." Chinese Political Law University professor He Bing said, "But there is often some leeway. If the business person insisted that they were just 'trying to be helpful' and the officials said that they were just looking for advice from friends, it is hard to decide under the law." Fengshui had been a simple explanation of nature in primitive society. During the era of the Northern/Southern Song dynasties, the emperor Song Mingdi prayed to the gods before he moved beds or repaired walls in his palace. The emperor Song Huizhong listened to the wizards and elevated the northwestern part of the imperial city in order to have more sons. "The old traditions are still in existence and caused fengshui to have a certain amount of influence in society." Central Party School Educational Research Department director Wang Changjiang told our reporter. "When our Party's revolutionary theories cannot fully explain the problems that arose from the reforms, the openings and the economic developments and when the new theories about the mission of the ruling party have not been fully developed, then the talk about gods and spirits rises up." "Therefore, these officials have problems in their beliefs!" said Professor Wang. "How come someone gets promoted and someone else loses their jobs? For some officials, there is a great deal of uncertainty." Beijing University Department of Psychology professor Wang Zhaiqing told our reporter. "If you cannot control things, you ask the gods and spirits for help. Because there are many rumors that fengshui works, it is a strong psychological hint for officials during the critical moment of job rotation." In the view of Yuan Jingzhai, "fengshui has it rationality and it is the secret that lies deep inside the hearts of the Chinese people." "But fengshui is not science." Teacher Feng who has done independent research on fengshui told our reporter. "Among the predictions, there are some random hits. The so-called claims on accuracy are either lies or frauds." Many examples illustrate this point. Two years after a Macau fengshui master made a special trip to Shenyang to inspect the Shenyang City Middle Court, the former director Jia Yongxiang was placed under "double discipline" by the Central Disciplinary Committee and was eventually sentenced to life in prison. Heilongjiang provincial Political Consultative Conference former chairwoman Han Guizhi was sentenced to a postponed death sentence in December 2005 for receiving bribes amounting to 7.02 million yuan even though she prayed to Buddha every day. The most corrupt female Hunan official Jiang Yanping also carried two "safety strings" on her feet that the "Grandmaster" obtained from the "gods", but she could not avoid the death penalty in the end. In the <Regulations of the Chinese Communist Party>, the opening section stated: "The Chinese Communist Party bases its actions upon important theories of Marxism, Leninism, Mao Zedong thought, Deng Xiaoping theory and the "Three Representatives." The 34th article of the <Party Regulations> require that "the various leaders and cadres of the Party ... will insist on learning, politics and righteousness and they will be able to withstand various trials and tribulations." These are precisely the firm negations of the superstitions held by the government officials.